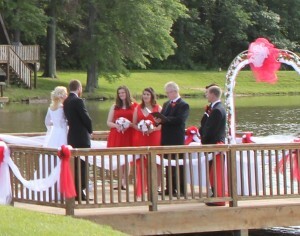 How will your guests will hear the officiate? How will your guests hear you and your fiancé exchange vows? What about processional, recessional, and other music or singing you wish to take place at your wedding ceremony? Designed with client convenience and satisfaction in mind, this system allows for your guests to comfortably hear every word spoken as you exchange vows. Music will be provided for Prelude, Escorting of Mothers, Pre-Processional, Processional, Sand or Candle Lighting Ceremony, and Recessional. 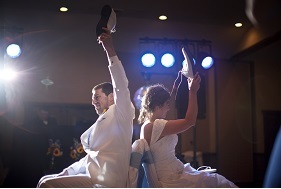 We will help you coordinate and select the special activities and music selection for your reception. We play only the songs you want to here. We usually wear dress pants and shirt unless requested otherwise. This is the ultimate package for a couple considering a wedding ceremony at a venue that does not have a PA system. Four bright, multi-colored, LED lights with an 8″ mirror ball. All announcements will be made in the utmost professional manner by the Wedding DJ such as, introduction of the bride & groom, bridal party, special dances, cake cutting, and bouquet and garter toss. We will work with your other wedding professionals to ensure the smooth flow of the reception so you can sit back, worry free, and enjoy your evening knowing that all the details are being attended to. The Wedding DJ will play only the songs you and your guests want to hear. We usually wear a tuxedo unless requested otherwise. Dance Floor Lighting Upgrade Adds 4 Bright, multi-colored, LED lights (for a total of 8) and upgrades to a 16″ mirror ball. Karaoke Package Adds a second microphone, monitor to display song lyrics and over 2800 karaoke songs to choose from.